Polycoated paper cups are designed to hold hot beverages. Heat-sealed seams and interlocked bottoms prevent leaks and help retain heat. Excellent for serving coffee, tea, hot chocolate or just about any hot beverage. Cup Type: Hot; Capacity (Volume): 10 oz; Material(s): Paper; Color(s): White. Disclaimer Statement: Product has regional availability. 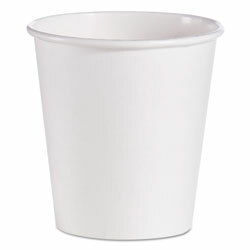 White Paper Cups from Solo Inc.! 256 In Stock today.